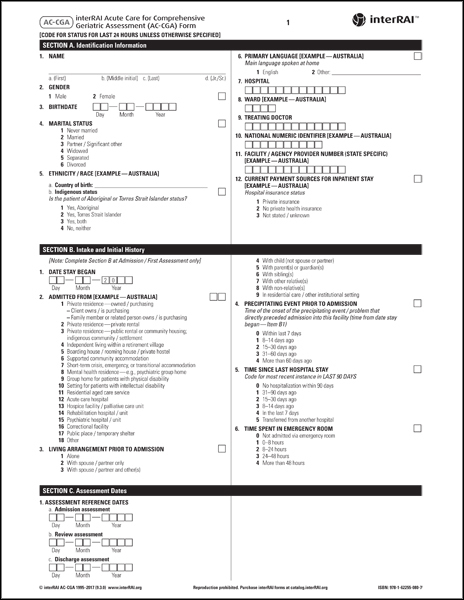 Please select quantity above for a special license to print the forms yourself. Once your purchase is complete, a PDF of the form will be emailed to you within 2 business days. Or, if you prefer to have us ship printed forms to you, please contact customer support at cservice@interrai.org or call 866-595-5055 (from within the US) or 1-978-546-8475 (from outside the US) for pricing and ordering. Please note that you must be licensed to use any version of interRAI forms. For information on licensing, contact info@interRAI.org or call +1-734-936-3261.